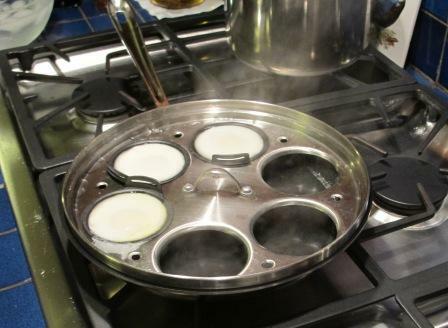 How to Poach-Fry Eggs | eat. write. smile. Wait, what? A poached-fried egg? That’s right, my two favorite preparations of eggs all wrapped up in one. Our chef instructor, Patrick Clark (formerly of California Cafe at Stanford and The Cliff House in San Francisco, to name a few local establishments- he knows his stuff), casually mentioned something about a poached-fried egg he used to top hot vegetable appetizers. The recipe-less instructions were: “You poach an egg, but then stop it in an ice bath, then once it’s cold, pat it dry on a paper towel. 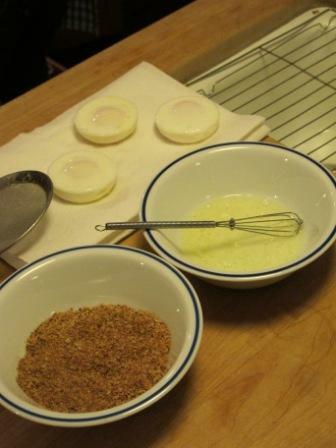 Brush it with egg whites, roll in bread crumbs and drop it in pretty hot oil for a minute or so. You’ll have a crispy, golden crunchy outer layer with a soft, still liquid yolk inside. It’s the best egg you’ll ever have.” I was intrigued. Saturday afternoon was cold and rainy, and I needed to do something, anything to raise my spirits. How about some good ol’ fashioned comfort food? I decided to try this poached-fried egg to see if it was all that Chef Clark cracked it up to be. First you poach the eggs. The first time I tried this out, I dropped the eggs straight into water with a little vinegar, but the second time I used an egg poacher with little cups. 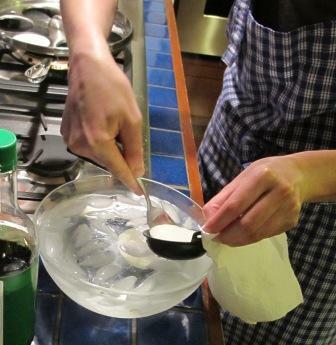 While the eggs poached, I set up the ice water, which stops the cooking process and keeps the yolk liquid. Make sure your egg is solid enough that it won’t break apart as you scoop it out; the little sucker has to withstand not only the ice bath but the breadcrumb roll as well. At 3:00-3:30, the eggs were perfect. I removed the eggs from heat and place them directly into the ice water bath. If you’re preparing other things with the poached-fried eggs, this juncture is a good time to get those items going. The eggs can just hang out in the ice bath until you’re ready to use them. 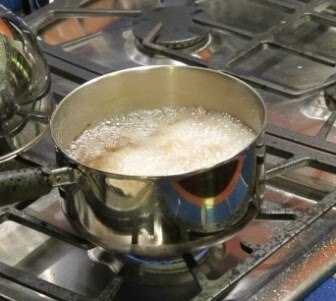 In fact, many breakfast restaurants will poach eggs before service and then quickly reheat them in hot water to order. That way, eggs Benedict doesn’t take thirty minutes. Once the eggs cooled fully, I pulled them from the ice bath and let them dry on a paper towel. Be gentle, these babies need TLC! I patted them dry, and then coated them with slightly whisked egg whites. I rolled them in bread crumbs (if you don’t have bread crumbs, they’re easy to make, just crush up slices of toast) and used a strainer spoon to drop them into three inches of hot canola oil (not smoking hot, but starting to make that popping sound hot). I left the battered eggs in the oil for a little longer than a minute; they should be light brown with a dark golden crispy skin when removed. Rest the eggs on paper towel. 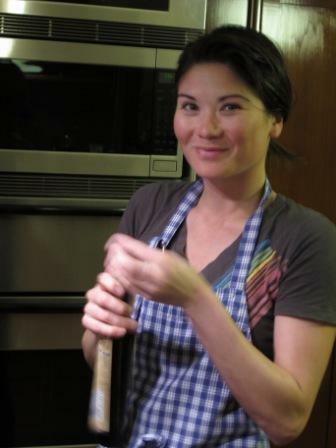 When you do break the crunchy eggs open- over a Brussel sprout salad like Chef Clark served at the Cliff House, or over a wilted spinach salad like I had this weekend- the piping hot but still miraculously soft egg will spill liquid yolk onto your dish, acting as flavorful protein-filled dressing. Though this method is time consuming, it’s hands-down worth it. The second time (yes, they’re that good, I made deep fried eggs twice in one weekend) was easier than the first, and my conversation with Chef Clark today confirmed that a few attempts is all it takes to master this preparation. I’m hooked; they’re insane! I’ll close with my father’s favorite photo. Thanks Pop for documenting the event! Ruthie, so sorry to hear about your friend CJ. "Eternal rest grant unto him, Lord, & let perpetual light shine upon him. May he rest in peace. 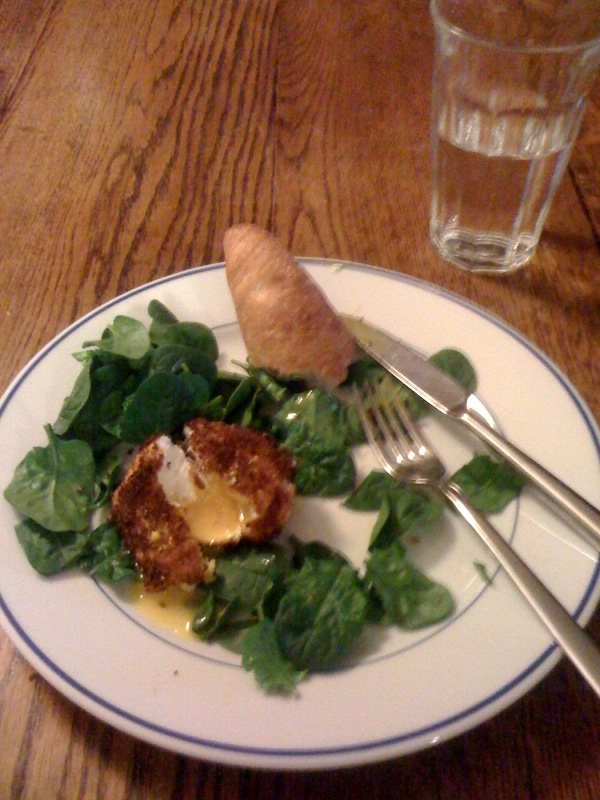 "Btw, first time to read your blog, noticed the link when I was updating my IE version.It's awesome!Poached fried egg . 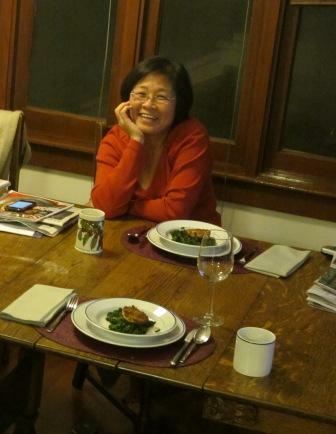 . . looks like a lot of work but deliciously mouth-watering!TY for the pics, haven't seen you & your Mom in ages. 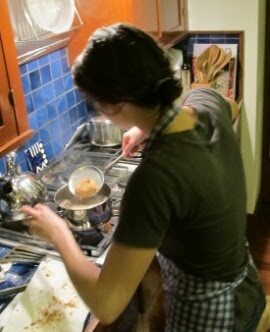 This entry was posted on February 22, 2010 by Ruthie in Culinary School, Eggs, Recipe.